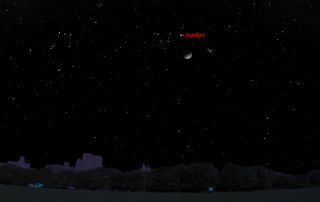 This sky map shows the location of Jupiter and the moon at 9 p.m. local time in the western sky on Feb. 17, 2013, as viewed from mid-northern latitudes. The moon will appear to sail past the bright planet Jupiter in the night sky tonight (Feb. 17) and Monday in the latest celestial encounter of Earth's natural satellite and the largest planet in the solar system. Each month since November, as seen from North America, the moon and Jupiter have engaged in a series of conjunctions. Perhaps you saw the full moon snuggle close to Jupiter just before Thanksgiving, or on Christmas night? The most recent conjunction of Jupiter and the moon on Jan. 21 was the closest pairing of all, with the moon appearing to skim just below Jupiter. This NASA graphic depicts the location of the planet Jupiter and the moon as they will appear close together in the eastern night sky at 11 p.m. (your local time) on Feb. 18, 2013. It is a much different story in February, however. The moon will make its closest approach to Jupiter on Monday morning (Feb. 18) at 7 a.m. EST (1200 GMT/4 a.m. PST). Unfortunately, both the moon and Jupiter will be below the horizon for North America, which means the best observers here can do is see the moon as it approaches Jupiter on this evening, and then follow up Monday night as the moon recedes from Jupiter. This NASA graphic depicts the location of the planet Jupiter and the moon as they will appear close together in the eastern night sky just after midnight on Feb. 19, 2013. On Monday night, the moon will be in a somewhat more noticeable gibbous phase, and will have moved to a point about 6 degrees to the left (east) of Jupiter. Jupiter is still the brightest "star" in the night sky and the first to come out at dusk, high in the south. It is more than two and a half times the brightness of Sirius — the brightest star in the night sky — which in early evening sparkles in the southeast 60 degrees to Jupiter's lower left. Note how Jupiter shines with a steady silvery glow while Sirius scintillates with a bluish-white glow, as if struggling to try and match Jupiter's brilliance. Jupiter is visible all night long. It currently sets in the west around 1:30 a.m. your local time. Jupiter is also accompanied by two naked-eye star clusters (the Pleiades and Hyades) and an entourage of other bright stars. It is receding and fading but nonetheless remains brilliant. By the end of April, Jupiter will relinquish the title of bright evening planet to Venus, as that planet begins to emerge from the glare of the setting sun. And on May 28, just over three months from now, Jupiter will have an eye-catching rendezvous with Venus low in the west-northwest sky. Editor's note: If you snap a great photo of Jupiter and the moon tonight and Monday that you'd like to share for a possible story or image gallery, send photos, comments and your name and location to managing editor Tariq Malik at spacephotos@space.com. Joe Rao serves as an instructor and guest lecturer at New York's Hayden Planetarium. He writes about astronomy for The New York Times and other publications, and he is also an on-camera meteorologist for News 12 Westchester, New York. Follow SPACE.com onTwitter @Spacedotcom. We're also on Facebook & Google+.